But that means I eat the same thing, day after day – and I’m trying to get out of that. It’s a bit boring, for one thing… But also, if I eat the same thing every day, I can’t tell if I’m reacting to anything. I want to deliberately vary my meals, to see what makes me happier, see if anything is associated with negative (or positive) reactions. Now, these variations haven’t quite managed this – the waffles still have corn in them (for texture) and I’m still eating eggs. But it’s a start. Besides – I have some ham on hand, and I like ham in these. 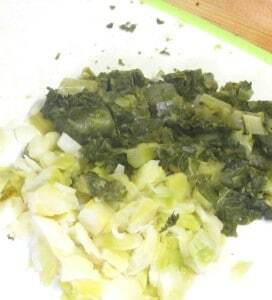 Then I add some green leafy vegetables, also cooked. This is really for flavor and interest, because it’s really a pretty small amount… In this case, I mixed them – used half a cup of cooked kale, and half a cup of cooked leeks. You can do all one kind, you can do a couple – you can just thaw frozen chopped spinach or chopped broccoli… You do want them chopped well, and you do want them thawed and, again, any liquid drained. 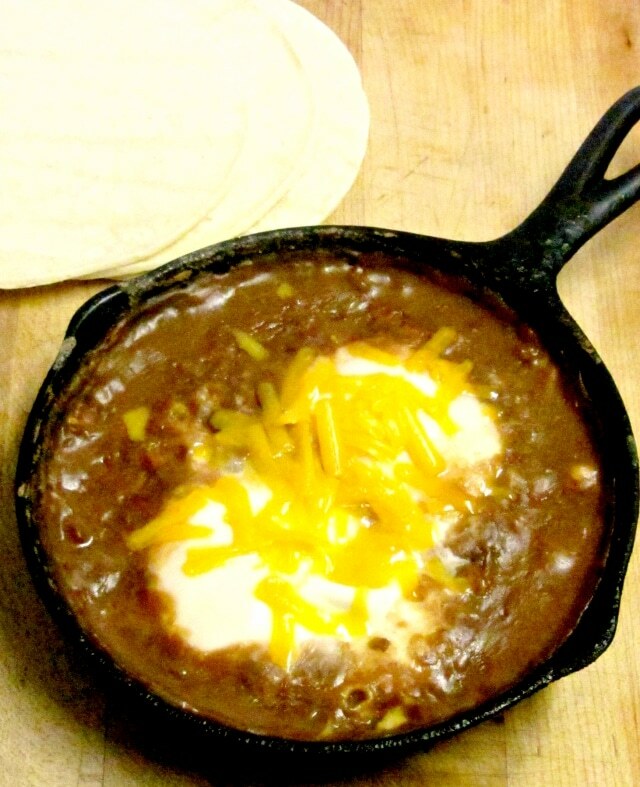 I made a dozen here – the recipe divides (or doubles!) easily. I buttered the pan well – these are tender, and if the egg sticks at all they tear easily. 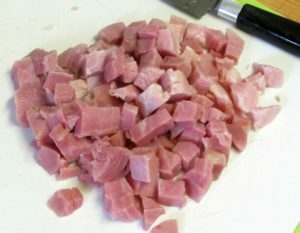 Then I divided the ham, and then the vegetables evenly among the muffin cups. I use one egg for each muffin. I beat them in a large bowl – you can use a blender for this, it’s easier. You want to make sure you really break up all the egg white, or you get odd clumps… but you don’t want it too frothy… air bubbles will cause problems later. So if you use a blender, let it rest a little while before pouring the egg into the cups. If I’m doing half a dozen, I beat them in a measuring pitcher and use it to pour the egg – a dozen won’t fit, so I use the Pyrex bowl with a pouring lip (I do like the design of these bowls – they’re easy to use) and start with a gravy ladle. At the end I pour out the last remains of egg, to distribute it evenly. Then I bake them, at 350°, for 20 minutes. They puff up as they bake, all very pretty – and then fall almost immediately… don’t be surprised (or disappointed…) Let them rest five minutes – they do sink, but also shrink away slightly from the sides of the pan, so that they are easier to remove without tearing. And there you have them. You can serve them at once. If you have guests it can be a nice breakfast dish – package the ham and vegetables ahead of time, pop them into the pan and pour beaten egg over them while the oven heats. Bake while everyone is getting coffee or eating cereal. But then if someone gets up later (or showers first to relieve the bathroom rush, if you’re all heading out to something) they get a pretty little muffin, not the sad remains of a breakfast quiche – and you don’t feel obliged to go scramble more eggs… You can even fairly easily make variations – with and without meat, or cheese. You can also refrigerate them, and either eat them cold or reheat in a microwave. That’s what I do – have cereal or waffles or something, and then grab a couple of these for a quick breakfast. 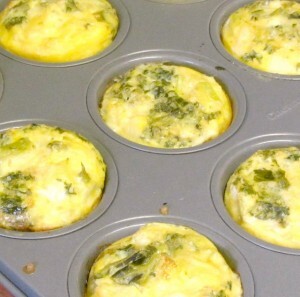 And, while they’re not really quiche, they’re close enough – you can eat them cold, and they will pack in a lunch. 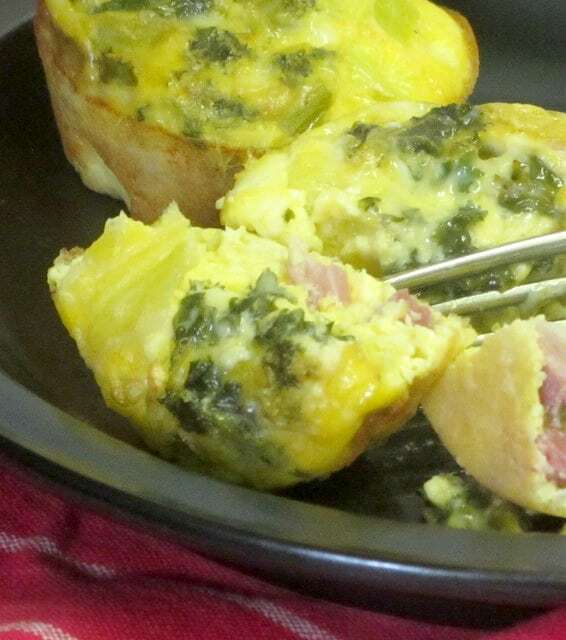 Bake egg muffins with ham for breakfast, then serve at once, or reheat for a quick meal. 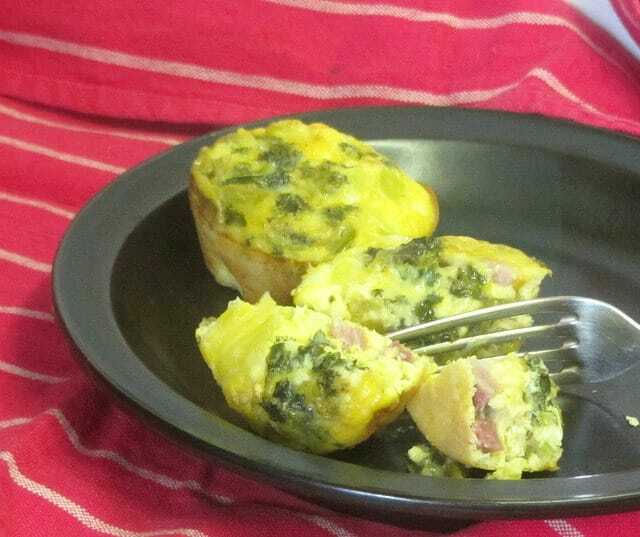 Distribute ham, and then vegetables, evenly between the muffin cups of a 12 cup muffin tin. Beat the eggs smooth. 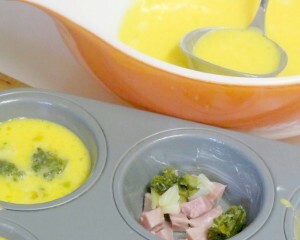 Pour evenly over the ham and vegetables in the cups. Bake at 350 for 20 minutes, or until egg is fully cooked. 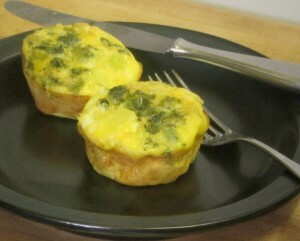 Or - refrigerate, and either eat cold or reheat in a microwave 30 seconds, for a quick breakfast.